(Central Islip, N.Y., June 10, 2015) – The Long Island Ducks defeated the Southern Maryland Blue Crabs 10-9 on Wednesday night in the finale of a four-game series at Bethpage Ballpark. The Ducks struck first in the opening inning on Lew Ford’s RBI single off of Blue Crabs starter Brian Baker. Southern Maryland answered back with five runs in the second inning off of Ducks starter Andrew Barbosa. A RBI single by Casey Stevenson, a three-run double by Fred Lewis and a run-scoring groundout off the bat of Renny Osuna did the damage. Long Island closed to within 5-3 in the third on another RBI single by Ford and a run-scoring double from Randy Ruiz. However, a run in the fourth and three more in the sixth extended the Blue Crabs lead to 9-3. RBI singles by Zach Wilson and Osuna, along with a two-run double by Lewis, highlighted the scoring. In the seventh, the Ducks stormed back with seven runs off of Blue Crabs reliever Fernando Nieve to take a 10-9 lead. RBI singles by Ruiz, Cody Puckett and Mike Blanke, along with Bryan Sabatella’s two-run double and Delta Cleary, Jr.’s two-run single, put the Flock in front. Neither starter factored into the decision. Baker pitched five innings, allowing three runs on eight hits and two walks while striking out two. Barbosa lasted four innings, surrendering six runs on eight hits and three walks with five strikeouts. Mark Rogers (3-3) collected the win after tossing a perfect top half of the seventh inning. Nieve (1-1) took the loss, yielding seven runs (three earned) on five hits and one walk in two-thirds of an inning. Ryan Kussmaul earned his 11th save with a scoreless ninth, stranding the tying run at third base. Cleary, Jr. led the Flock with three hits, two RBI and two runs. Sabatella, Ford, Ruiz and Blanke each added two hits. 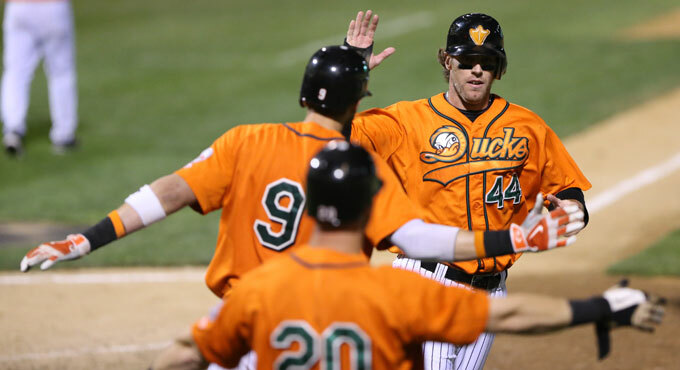 The Ducks hit the road on Thursday to open up a four-game series with the cross-sound rival Bridgeport Bluefish. Game time is slated for 7:05 p.m. at The Ballpark at Harbor Yard. Right-hander Ian Marshall takes the mound for the Ducks against Bluefish southpaw Scott Maine. Fans can follow all of the action on the Ducks’ official YouTube channel. Live streaming audio will be available online by CLICKING HERE. Long Island returns home on Tuesday, June 16 to open a three-game series with the Sugar Land Skeeters. First pitch is scheduled for 6:35 p.m., with the Bethpage Ballpark gates opening at 5:35 (5:20 for full season ticket holders). It’s “Don’t Zone Out” Night at the ballpark, and the first 2,500 fans in attendance will receive a Ducks Static Cling Decal, courtesy of CSEA. Tickets to the game and all Ducks home games are available by visiting the Bethpage Ballpark box office, calling (631) 940-TIXX or CLICKING HERE. Duck Tales: The Ducks earned their 10th win in a row, which is the longest winning streak in the Atlantic League this year. The previous high was seven, done by the Blue Crabs from May 7 to 14. The streak is also tied for the third-longest in team history. Long Island also won 10 in a row in 2001. The longest winning streak in franchise history was 12 games, done July 5-20, 2006. The Ducks have now swept back-to-back four-game series and have earned three series sweeps overall this year…Wednesday marked the third time this season that the Ducks rallied from a deficit of six runs or more to win a game. Long Island previously overcame a deficit of eight runs (9-1) on May 8 against Lancaster for an 11-10 win, and they came back from a seven run deficit (8-1) at York on May 20 for an 11-9 victory. The Ducks have now earned 12 come-from-behind wins this season, including in each of the four wins this series over the Blue Crabs...Long Island has broken out the bats in a big way during their 10-game winning streak. The Ducks have combined to score 71 runs on 116 hits in their last 10 games. That’s an average of 7.1 runs and 11.6 hits per game. The ducks lead the Atlantic League in batting average (.278), runs (226), hits (440), walks (159), on-base percentage (.352) and slugging percentage (.380)...Bryan Sabatella extended his hitting streak to nine consecutive games with two hits. During the streak, the Long Island native is batting .452 (19-for-42) with eight RBI and 11 runs scored. He has now earned hits in 20 of his last 22 games, reaching base safely in 21 of them. The outfielder leads the Atlantic League in hits (59), runs (38), at-bats (196) and stolen bases (15)…Delta Cleary, Jr. extended his on-base streak to 13 consecutive games with a single and a double. During the streak, the outfielder is batting .333 (19-for-57) with three doubles, one triple, five RBI, 11 runs and six stolen bases. (3). SH--D.Cleary Jr. (0). SB--F.Lewis 2 (4), C.Stevenson (1), D.Cleary Jr.
2 (10). E--D.Ward (3), G.Molina (1). LOB--S Maryland 6, L Island 10. DP--D. Lyons(SS) - J. Griffin(1B), J. 18-10, A.Diaz 17-11, R.Kussmaul 15-12.